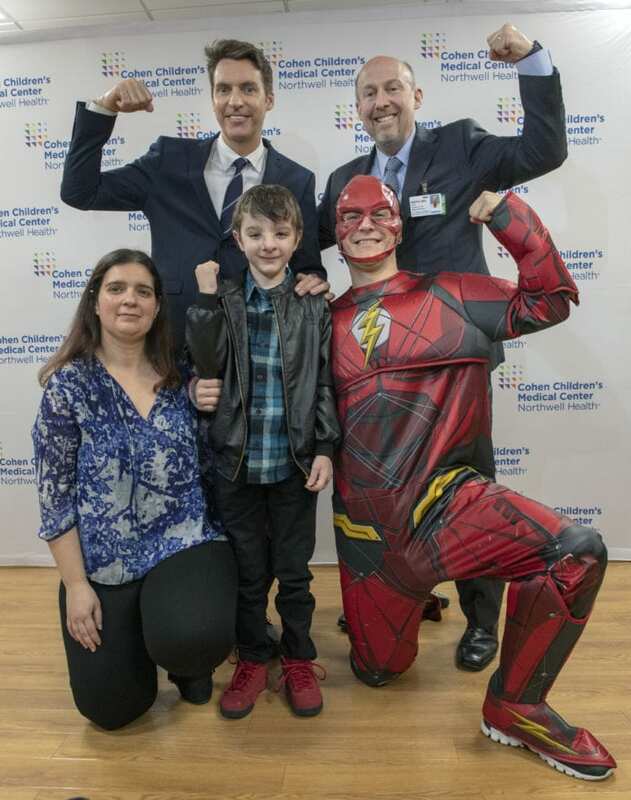 It’s not every day that a little boy gets to thank the surgeons who put his face back together again after a difficult surgery – and take a photo with his hero, the Flash. But, that’s just what happened to 9-year-old Simao Meco at Cohen Children’s Medical Center on Feb. 7. Meco, who was joined by his mother, Lisa Meco, and 13-year-old sister, Maria, returned to Cohen Children’s to thank the two surgeons who performed a complex, six-hour surgery that succeeded in correcting the rare Tessier craniofacial clefts with which he was born. Dr. James Bradley, Meco’s facial reconstruction surgeon, is one of only five surgeons in the world with the training to perform this complicated procedure. As soon as he saw Meco, Bradley knew that he would have to perform the facial bipartition surgery. In simplest terms, he would have to split Simao’s face in half vertically, and then bring both sides back together with proper re-alignment. During surgery performed on a pro-bono basis at Cohen on Jan. 8, Bradley repositioned the affected eye to point in the proper direction; adjusted the sinus cavities, which were overgrown between Meco’s eyes, thus negatively affecting his breathing; and modified the structure of his nose. “I’m happy to report that Simao is healing so well that he will be returning to school tomorrow,” Bradley said. Lisa Meco recalled how difficult it was to watch her friendly, outgoing son suffer from the cruel taunts of bullies. Because Meco listed the Flash as his favorite superhero, his doctors felt that a surprise meeting should be arranged. So, after Meco described his feelings about going back to school with a new face, there was a knock at the door. And, to his surprise, the Flash, himself, raced into the room to present his biggest fan with an Xbox game and to wish him a “speedy” recovery.